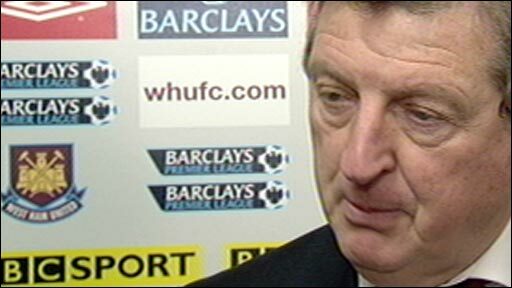 Defensive errors proved costly for Fulham as West Ham eased to victory at Upton Park to go eighth in the table. 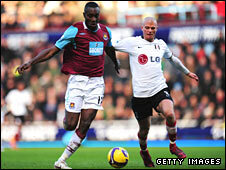 John Pantsil's poor concentration allowed David di Michele to put West Ham ahead before Paul Konchesky drove home a stunning 30-yard equaliser. Mark Noble restored West Ham's lead from the penalty spot after a foul on Carlton Cole. And it was Cole who sealed the win when he slid the ball past Mark Schwarzer for his fifth goal in as many games. It was Fulham's first defeat since November and saw them drop to 10th in the table. Before the game, however, all the talk was of Craig Bellamy, who was omitted from the West Ham side after reportedly being unhappy at the club's refusal to allow transfer talks with Tottenham and Manchester City. His replacement was di Michele, and on six minutes the Italian put his team ahead in comical circumstances. Lucas Neill curled the ball in from the right-hand side of the box and Fulham's former West Ham defender Pantsil chested the ball down, unaware that di Michele was lurking just behind him. The Italian stepped in between the defender and Schwarzer, took one touch to control the ball and put it in the net with his second. The home side were comfortably on top for the first 20 minutes until, out of the blue, Fulham equalised through Konchesky, another former West Ham player. Credit to Zola and Cole for working so hard together. They had belief where some of us didn't, and I am not sorry to be proved wrong. Well done, Carlton! Keep it up! He silenced the home fans with a swerving shot off the outside of his left foot into the top right-hand corner, his first goal since scoring for West Ham in the 2006 FA Cup final. Apart from the two goals, the first half was a fairly tame affair with West Ham keeper Robert Green having precious little to do, and Fulham's Brede Hangeland preventing Schwarzer seeing too much of the action. Both sides continued to struggle for rhythm after the restart and when the next goal came, it was again the result of a Fulham defensive error. Cole forced his way past Konchesky in the box after the defender took his eye off the ball, and an attempt to retrieve the situation with a last-ditch tackle was mistimed. The penalty decision was a formality after Cole was sent sprawling to the ground and Noble lashed it home. This seemed to inspire West Ham and Cole, in particular, and he came within inches of adding a spectacular third when he controlled a long ball, turned and fired a shot just wide of the post. Danny Murphy did his best to revive Fulham, but their third big error puit the game out of reach. Dickson Etuhu's weak pass on the halfway line was easily intercepted by the impressive Jack Collison, who found di Michele, and he in turn played the ball perfectly into the path of Cole, who calmly slotted home to secure the points. "We made it comfortable with the way we played, especially in the second half, it was excellent. "I thought the match had a strange atmosphere, it was a bit flat at the beginning but we made it happen and I told them I was proud of them. "It was like we were playing in a very silent place, I couldn't understand, but the players came on in the second half they knew what they had to do and they did fantastically well, and we got out with three points well deserved. 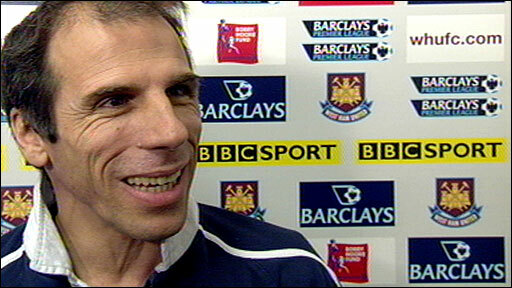 "We took the goals very well, Fulham are not a team that concedes very much, so it was a big point for us." "I thought West Ham deserved to beat us, we were far from at our best but the manner in which we conceded was very unlike us. "Today in general play against a skilful West Ham team, we contained them pretty well but it's difficult when you're playing good teams and go behind, it's hard to pull yourself back to parity." West Ham: Green, Neill, Collins, Upson, Ilunga, Behrami, Parker, Noble, Collison, Cole, Di Michele. Subs: Stech, Dyer, Boa Morte, Mullins, Faubert, Tristan, Sears. Fulham: Schwarzer, Pantsil, Hughes, Hangeland, Konchesky, Dempsey, Murphy, Etuhu, Davies, Zamora, Johnson. Subs: Zuberbuhler, Nevland, Gera, Gray, Andreasen, Kallio, Baird. BBC Sport Player Rater man of the match: West Ham's David di Michele 7.84 (on 90 minutes).